Atlantic City was Disneyland before there even was a Disneyland. It specialized not in the Peter Pan illusion of endless youth, but it the American promise of making it, of easy money. That was the fantasy for sale in the Boardwalk Empire days of Nucky Johnson, at the Miss America Pageant (an Atlantic City invention), in the game of Monopoly that featured the city’s streets, and in the casinos of our current age. Behind the set stages of the Boardwalk, however, there was always the reality of a city, a place of department stores and pawn shops, the well-heeled and the down and out, tourists and locals, black and white. Yesterday’s storm brought the tensions between the two Atlantic Citys to the forefront, again. The pictures tell a devastating story about both Atlantic Citys. For hours, Sandy pounded, and then overwhelmed, the city. The ocean surged into the streets. Refrigerators, microwaves, and radios floated down Pacific and States Avenues. Water reached halfway up the doors on the pastel faux fronts of Bally’s Wild, Wild West Casino. 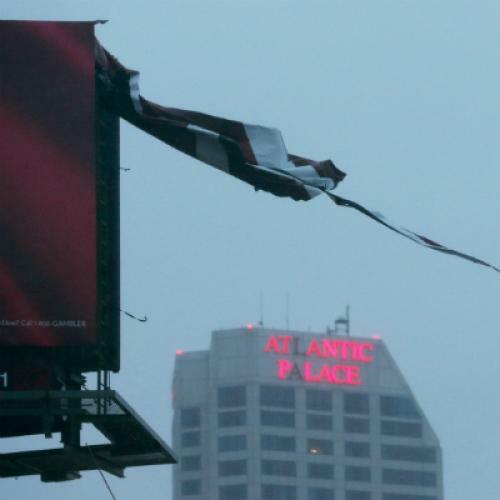 Howling winds ripped the “j” off the sign of Donald Trump’s Taj Mahal. And clumps of the wooden Boardwalk, the only Boardwalk in the world spelled with a capital B, ended up two blocks away on Atlantic Avenue, a yellow property. In the middle of the maelstrom, New Jersey Governor Chris Christie went on camera wearing a blue fleece jacket and a serious look. He updated reporters on the storm’s course and on the damage it had already done. He explained in detail what first-responders were doing. He even had a few kinds words for President Obama. But not for Atlantic City’s Democratic Mayor, Lorenzo Langford. Langford scoffed at the Governor’s charges that he had failed to encourage city residents to evacuate. The next morning, he told Today Show’s host Matt Lauer that he wanted to go "mano-a-mano" with Christie. Sandy isn’t the first time Christie and Langford have clashed. And their clash, ultimately, gets back to the tension between Atlantic City the fantasy place and Atlantic City the hometown. It was time for something dramatic, Christie said. He would save the city by dividing it up. Christie’s plan, which is now in place, was to create a new tourist district that included the casinos, the Boardwalk, and the Walk, a thriving (and now under water) outlet mall a few blocks from the ocean. These sections of the city, the profitable ones, would be taken away from local government and controlled by a new state agency. With the help of millions of dollars of added state money–not Christie’s usual prescription–the Governor promised that the new cleaned up and heavily policed tourist district would convince people to give Atlantic City yet another second chance. With the money made from Revel casino and at the Gap and J. Crew stores, he promised, revenues would trickle down to the sagging homes along dowdy Baltic and Mediterranean Avenues. Of course, that geography—with the haves being Boardwalk entrepreneurs and out-of-town visitors—long predated the storm. Still, Sandy’s destruction, and the inevitable talk of post-storm renewal, signal a new turn in both the Christie-Langford feud, and the tension between the two cities within a city. State and federal funds will flow, for a while at least, into the city. But the real question is, what kind of city will be recreated there? Will it remake the past or create something new? Will it be rebuilt in the interests of Boardwalk fantasy makers or the people who serve the meals and deal the cards? Will Christie control the conversation, or will Langford? The smart money has to be on Christie and his national ties and even bigger national ambitions. Which might be good news for Atlantic City the fantasy metropolis. But it likely won’t mean much will change in the dowdy old town Langford controls.